It won’t take you long to appreciate the benefits of your new pergola. It is a beautiful new addition to your home, providing the perfect entertainment space to welcome your guests come rain, hail or shine. Sometimes the party only really gets started after the sun has set. 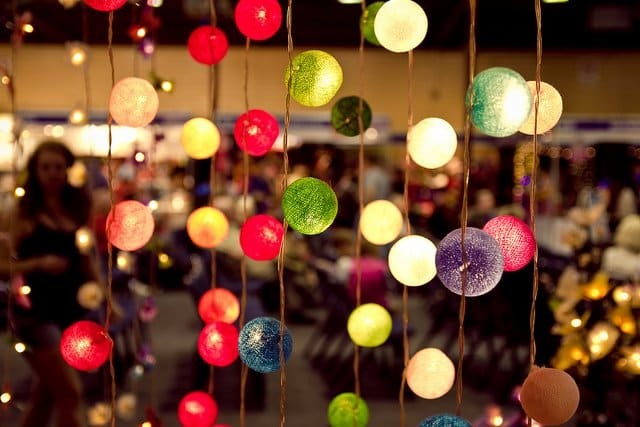 Don’t limit your outdoor fiestas to daylight hours. Install outdoor lights around your pergola and you can enjoy the outdoors at all hours. You have plenty of pergola lighting options, given the multitude of styles and designs for outdoor lighting. So it’s easy to feel like you’re taking a stab in the dark if you have little knowledge about lights for pergolas. There are some things you’ll want to consider to make the most of your newest nocturnal entertainment area. What lighting you need depends on the design, shape, dimensions, purpose and location of your pergola. And you should also factor in the personal style you’re seeking in an entertainment area that will epitomize your home’s personality. 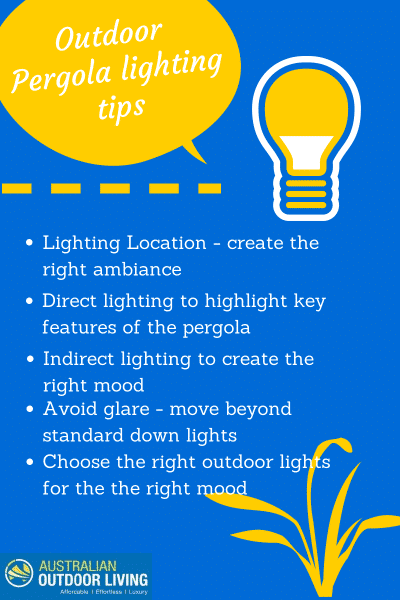 Below are some easy tips to follow to aid your pergola lighting design. Where you choose to position your lights will greatly impact the ambience of your pergola, since the angles of light will affect the shadow, style and overall feel of your outdoor space. When planning where to put your pergola lights you’ll want to consider every aspect of your outdoor space – you want the area around your guests to be lit up whether they are sitting or standing, by the barbecue or at the table with wineglass in hand. Keep in mind the location of the pergola itself; a freestanding pergola may require more thought if you want to install electrical lighting. It may be easier to plan lighting for a pergola attached to your house, but choose the position of your lights before you wire up your pergola. Pergola lighting design can fall into two brackets: direct or indirect lighting. Direct is where your lights are trained on particular features of your pergola, such as the barbecue or kitchen, your seating area, and any highlights. Indirect lighting is more about mood, illuminating the general area. Enchant your guests with a combination of the two to set the tone and mood for a night of good fun. The best lighting design manages direct and indirect lighting from all angles to create an even effect. The key to pergola lighting is to make it subtle. Play it cool with minimalistic lighting – avoid anything too big or too bright. You’ll want different lighting styles to blend together to create an overall radiant look for your pergola. In your initial research you may notice that there are a lot of different light bulbs to choose from. Surprisingly, they do all vary according to colour, energy usage and life. Incandescent bulbs are common but they’re not the most efficient. They tend to have a short life and need a lot of energy. Fluorescent lights are more economical and energy efficient than incandescent bulbs. They also last longer and come in a range of colours. Halogen lights have a longer life and need less electricity to run than incandescent lights. They produce more, and whiter, light. LED lighting for pergolas, though more expensive than the options above, have a much longer life and are pretty energy-efficient. A word to the wise: make sure your light bulbs are intended for outdoor use. Avoid the sparks flying from your light bulbs by making sure they’re waterproof! Once you’ve decided where you’d like to place your lights, you can start thinking about the best lighting styles for your pergola. It’s easy to follow the conventional path of overhead lighting, but sometimes it pays to be creative. Think about installing lights at ground level, seating level, and eye level as well to balance shadows cast from light overhead. 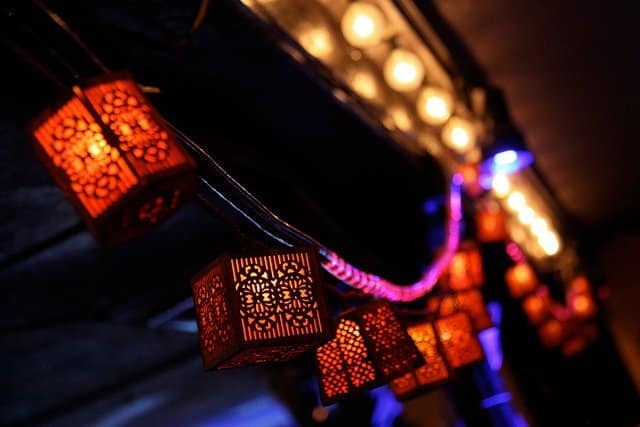 Thinking outside the box for creative pergola lighting ideas. Photo credit: Chris Goldberg via Flickr. Pergola downlights are one of the most conventional choices for outdoor lighting arrangements. Having said that, you can still make your space sparkle with a bit of creativity. Why not install a chandelier? Or you can string chaser lights or fairy lights across the ceiling beams. Hanging lights over a table setting add a rustic charm. Although we call it eye level, it is in fact better to arrange your lights just below or above the level of your eyes so your guests don’t have to squint just to see each other. Lamps and wall lights are both the perfect choices for mid-level lighting. You can use wall fixtures and sconces to position lights to the sides of your pergola for effective indirect lighting. Few people think to install ground level lights along the bottom of their pergola, yet it can actually look incredible. Ground level lights such as uplighting or even just garden post lights can be used to outline the edges of your pergola and accentuate surrounding plants or other features. The atmosphere produced by a pergola with lots of floor lighting is simply awesome if done right. For an even more creative look, try combining a mixture of uplighting and downlighting. This can elongate shadows and cast your whole pergola into a dreamlike state. Although not strictly a lighting tip, pergola fans often feature a strong light fitting in the centre of the fan. And since the fan is likely to be in the centre of the pergola, it can serve as the central indirect light source. Having a dual purpose light and fan is perfect for those loungy summer afternoons and helps keep the area cool for dinner or while you read a book. Many outdoor lights, especially LEDs, are available in a range of colours and these don’t have to be restricted to the festive seasons. For a bit of fun, try installing a few different colours. We’ve seen all manner of outstanding decorative light fittings, from the wacky ad hoc styles to the structured. And if your pergola is free-standing, don’t forget you can line the walkway from your house to the structure with equally inspired colours so that you can easily access your home and have fun along the way. A pergola is a great fixture for any Australian garden, where warm temperatures draw you and your guests outdoors for as long as possible. Aussie evenings can be particularly bewitching, with a sky filled with stars and cicadas chirruping their songs of summer. Light up your pergola and your guests will be drawn outdoors, hypnotized by its beauty.